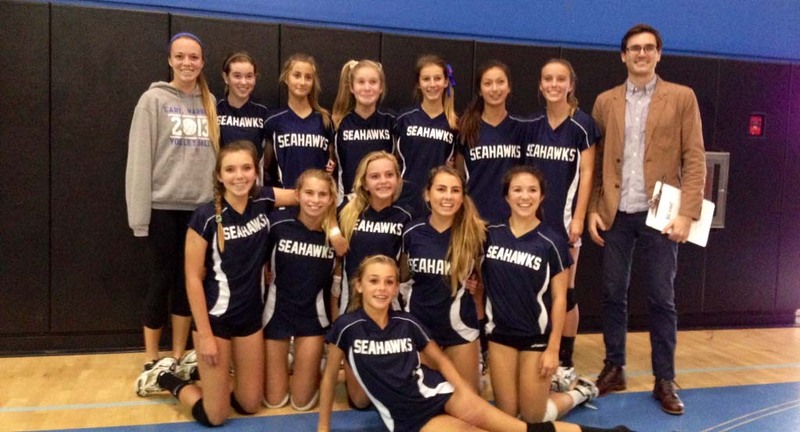 SOLANA BEACH — The Seahawks, Earl Warren Middle School’s eighth-grade girls volleyball team, went undefeated this year, winning 30 games to earn the title of Big 8 champions following 25-14, 25-15 wins against Rancho Santa Fe during the Nov. 12 finals at the Solana Beach Boys & Girls Clubs. “It was really cool,” said player Ellie Auerbach, who was the last to serve in the final victories. Ellie said the secret to the team’s success this season is friendship. Head coach William Raschke agrees. “The first time we beat Carmel Valley I thought, ‘This team is really impressive,’” he said. “And it wasn’t because it was a great game. In fact, they started poorly but they improved throughout the game,” he added. Raschke said he knew they would go all the way when the girls stepped it up on defense during the final games. Assistant coach Carly Auerbach, Ellie’s older sister, gave Raschke most of the credit for the undefeated season. In addition to Earl Warren, Rancho Santa Fe and Carmel Valley, the Big 8 includes teams from Oak Crest, Diegueño, Calavera Hills, Aviara Oaks and Valley middle schools.